FEED is renown for their stylish bags that benefit children in need, and the company has just added two covetable do-good diaper bags to their collection. FEED enlisted the help of mommy blogger/designer Joy Cho (of “Oh Joy!“) to help create the sweet limited-edition cotton diaper bag design (shown above) in one of her signature happy polka dot patterns. The second diaper bag boasts FEED’s “utilitarian-chic” brown natural burlap, and it’s also a versatile, roomy bag for Mom or Dad. Features of these bags include a vegan faux suede bottom, interior gray lining with three large pockets for baby gear, exterior pockets with large zippered pocket on one side and two end pockets for bottles, easy zipper closure, adjustable messenger strap, plus each bag includes a handy changing pad with the “FEED” logo. Best of all, for every FEED Diaper Bag sold, one mother and her child will be provided with an entire year of essential micronutrients – the perfect way to celebrate “The Joy of Motherhood For All” this Mother’s Day. 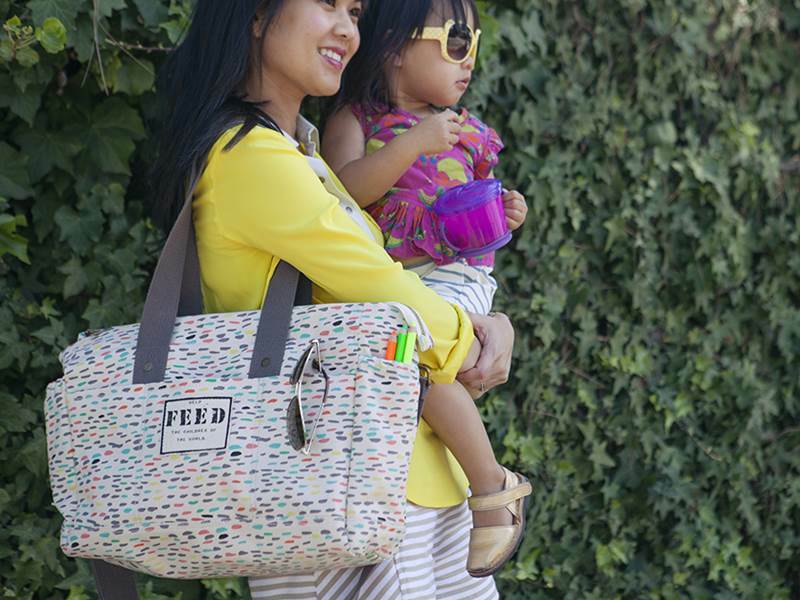 FEED is renown for their stylish bags that benefit children in need, and the company has just added two covetable do-good diaper bags to their collection.�FEED enlisted the help of mommy blogger/designer Joy Cho (of "Oh Joy!") to help create the sweet limited-edition cotton diaper bag design (shown above) in one of her signature happy polka dot patterns. The second diaper bag boasts FEED's "utilitarian-chic" brown natural burlap, and it's also a versatile, roomy bag for Mom or Dad. Features of these bags include a vegan faux suede bottom, interior gray lining with three large pockets for baby gear, exterior pockets with large zippered pocket on one side and two end pockets for bottles, easy zipper closure, adjustable messenger strap, plus each bag includes a handy changing pad with the "FEED" logo.�Best of all, for every FEED Diaper Bag sold, one mother and her child will be provided with an entire year of essential micronutrients - the perfect way to celebrate "The Joy of Motherhood For All" this Mother's Day.